The 210-4410 Standard Mercury Thermometer is 10.5" long and is mounted on a stainless steel back. Two models are available: the 210-4410 with a range of -38° to +130°F and the 210-4411 with a range of -38° to +55°C. Accuracy is ± 0.15°F above freezing. 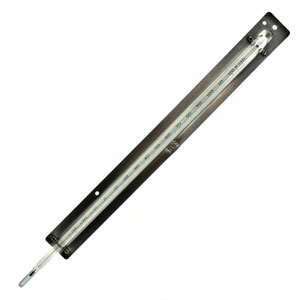 The 210-4410 Standard Mercury Thermometer is 10.5" long and is mounted on a stainless steel back. Two models are available: the 210-4410 with a range of -38° to +130°F and the 210-4411 with a range of -38° to +55°C. Accuracy is ± 0.15°F above freezing. 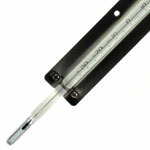 A stainless steel support is available to mount the thermometer the proper distance from a wall.